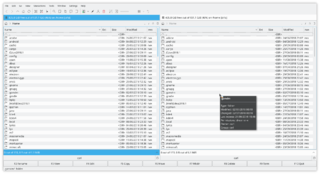 Krusader is an advanced twin panel file manager for KDE and other desktops in the *nix world. Krusader is an advanced twin panel (commander style) file manager similar to Midnight or Total Commander. It provides all the file management features you could possibly want. It supports a wide variety of archive formats and can handle other KIO slaves such as smb or fish. It is (almost) completely customizable, very user friendly, fast and looks great on your desktop! You should give it a try. See the Krusader Website and the Krusader Handbook. This page was last modified on 22 June 2011, at 09:38. Content is available under Creative Commons License SA 4.0 unless otherwise noted.